Mandy Aftel, Aftelier’s founder and nose, says she was inspired to create Palimpsest while she was researching her newest book, Fragrant: The Secret Life of Scent. “I wanted to capture the feeling of how the past is alive in the present, but transformed into a beautiful, shadowy feeling of layered richness and sensuality,” she writes. Palimpsest smells dense and telescoped. A sniff tells you right away that it’s not a bright, diffusive department store perfume. The fragrance starts with a flash of green that instantly gives way to a focused heart of fruit I imagine to be dark purple with a velvety skin, like a fig — but not a fig, and not anything I’ve seen at the supermarket. Sometimes the fruit stays fruity, and sometimes it turns more vanillic, reminding me of a chocolate-covered banana, especially if I put my nose right up to skin. Further away, I smell ylang ylang more clearly. To me, Palimpsest has a tropical feel. These aren’t the tropics of Club Med and suntan oil, but the sort of tropics you’d see on a sepia-toned postcard of wooden trading ships and wind-blown palms. Also, since the fragrance is so rich, I’d wear it with sweaters on a cold day rather than on an island vacation. Palimpsest is heady — it packs some sillage — and it wears all day, no problem. As for whether Palimpsest plays the hide-and-seek of a real palimpsest, I don't really smell it, but that could be my skin or my faulty nose. In any case, it doesn't make the fragrance any less interesting. Aftelier Palimpsest is available as a 7 ml Parfum ($170), 30 ml Eau de Parfum spray ($170), and 2 ml Parfum mini ($50). Samples are $6. To buy Palimpsest, see Aftelier under Perfume Houses. 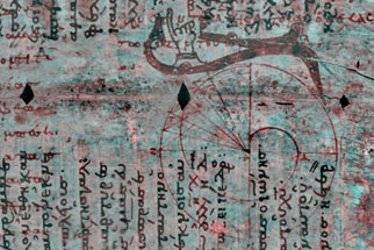 Note: image of the Archimedes Palimpsest via PBS / NOVA. It’s the layered past that I love about Europe and to some extent New York City. Aftelier is one of my favorite lines, and I’ll definitely try Palimpsest. Definitely agree re: layered pasts in cities. Love that feeling when traveling! I just got a sample of this and I really like it—I think it’s one of my favorites of hers, and I have minis of several of them. I’m not sure I can pick out the firetree note, and to me it smelled an awful lot like osmanthus (which I suppose would be the peach?). Did you try the EdP or the parfum? I ordered samples of both and for me the EdP was longer lasting. My sample is the EdP, and it really does last a long time! People who worry that natural fragrances don’t last will change their minds with this one. I’m at a loss for what firetree smells like, too, but I can see where you think of osmanthus. I suppose the magic is in how it all comes together. Off topic, but directed to the correct person: I finshed reading my copy of The Lanvin Murders on the weekend. Of course I enjoyed the fragrance references and really liked learning more about vintage clothes. Looking forward to Dior or Die. Thank you! These books are so fun to write. I’m always so happy when I hear that someone spent an entertaining few hours with them. I got my sample of Palimpsest and will have to find the right time to test it. Firetree is an Australian tree. Thank you so much Angela, I’m elated by your wonderful review! Your beautiful writing explains the deeper facets of Palimpsest so well, and yes, the amazing longevity comes from the firetree, which has the world’s longest and most intense drydown. It’s been used forever in traditional medicine, but also has such a complex and unique aroma, morphing into completely different smells. It makes quite a journey from lilac & rose notes, milky undertones, sweet & spicy floral, then woody, earthy, slightly leathery, and finally smoky & oud-like. That’s why it took me 3 years to figure out how to use it! Thank you for your description of firetree! Maybe you’ll start a trend, and firetree will be the new oud (or maybe it would be better if it didn’t).